There are a lot of squirrels living in the trees behind my house, and there is nothing unusual about that. However, within the last few months, I noticed a white-tailed squirrel in the trees and on the ground, and that is unusual. I had never seen a white-tailed squirrel here, or anywhere. This evening, just before dusk, I had my camera out with the speedlight (flash) attached, when I spotted the white-tailed squirrel, and so I grabbed the camera, adjusted its the settings, and captured an image of the squirrel across the yard (above image). Then, as I was watching the squirrel, it climbed a tree and entered a hole in the tree that I had never noticed before. The tree is at least 75 feet away. 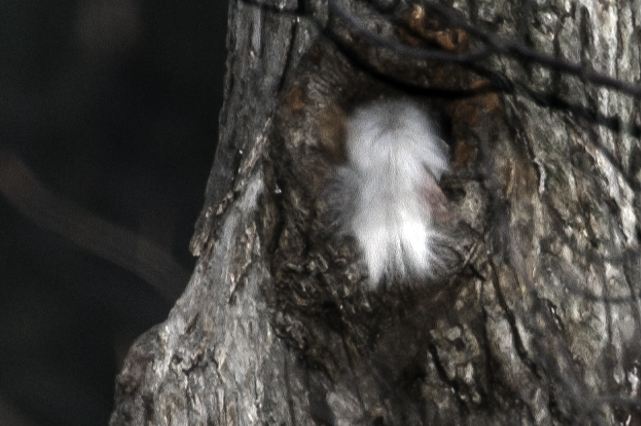 In the above image, I photographed the squirrel’s white tail as it entered the hole in the tree, where it apparently lives. 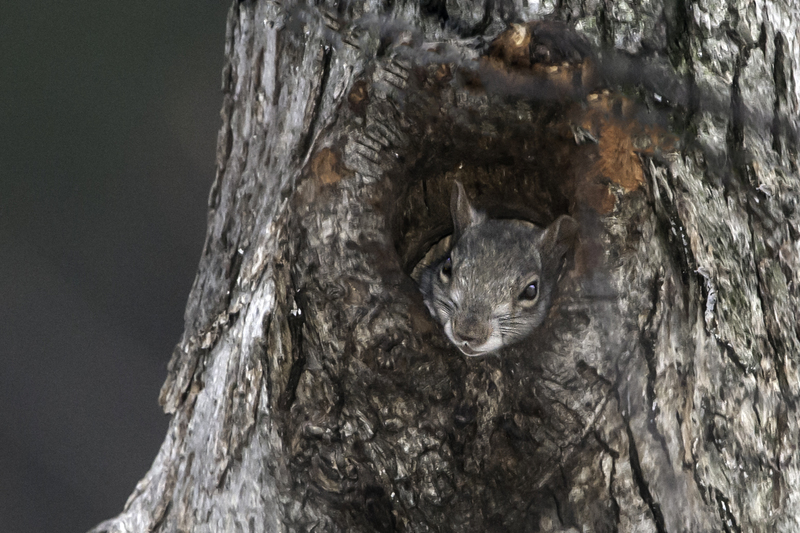 After entering the hole in the tree, the squirrel turned and stared at me while I continued to photograph it. When no longer interested in me, the squirrel turned and disappeared into the tree, although I was able to get a photo (below) of its white tail in the tree before it totally disappeared. 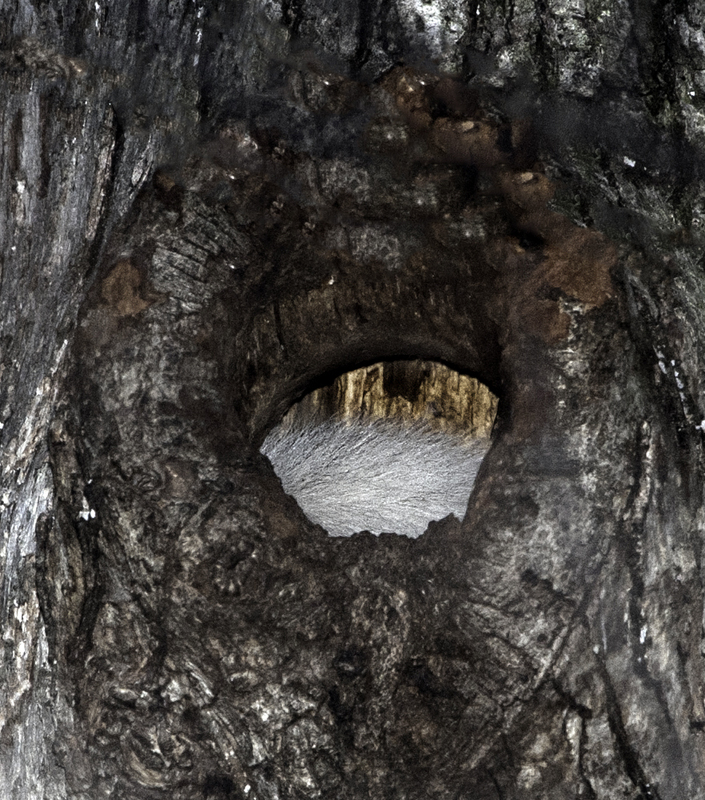 The light from my speedlight made it appear as though the squirrel had its lights on in its nest for the evening, but actually the speedlight lit up the bare wood in the back of the hole. 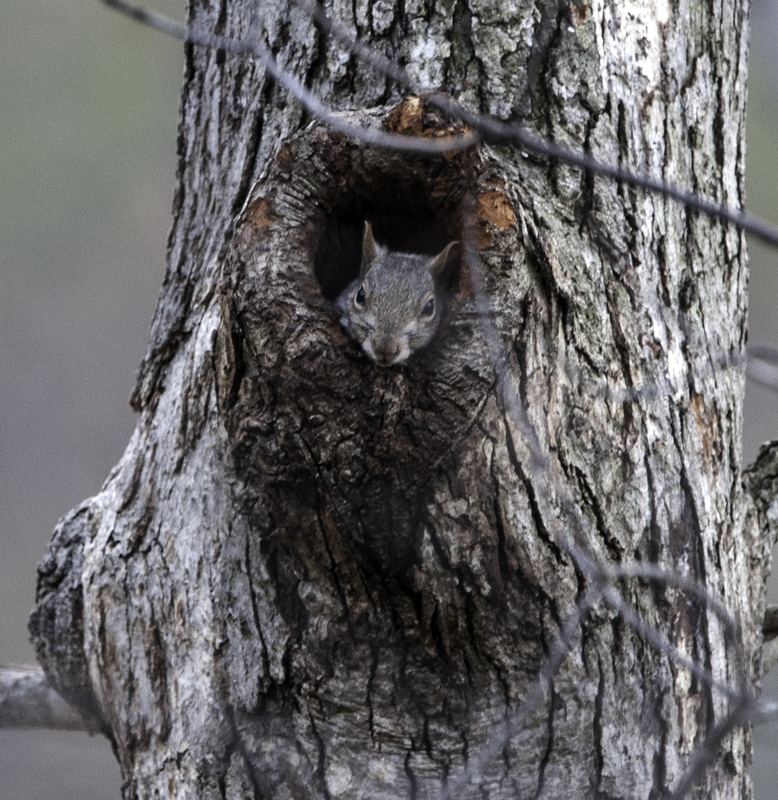 I am excited to have been able to photograph this unusual squirrel, and also excited to see that its nest is directly facing my house. I will be watching it closely this summer, because if the squirrel is a female, it may raise its young in that nest, and I will be able to photograph them. This entry was posted in Nature, Wildlife and tagged squirrel, white-tailed squirrels. Bookmark the permalink. Thank you for “capturing” this squirrel for us armchair naturalists! Love the photo of the squirrel checking you out … the texture of the trunk, the composition of the photo and its overall greyness are simply wonderful! Having a white tail might make is strange! I don’t think I ever heard of white squirrels unless they were albino. Locally, we have grays, reds, and occasionally black. I live in a small town in Central Illinois. We have just noticed a white-tailed squirrel in our neighborhood. At first, the only thing I saw was this furry white thing bouncing around and then I realized the furry white thing was attached to a grey squirrel. He does stand out in a crowd. I googled white-tailed squirrels and found your blog. These cute little guys must be spreading out across the U.S. I would love to know more about them – thanks for your pictures and for sharing your story with us. We saw a white tailed squirrel on our farm near Stoutsville Ohio. We are trying to get a picture of it ,when we do we will post the picture. We just saw two white-tailed squirrels for the first time in our yard today (Michigan). They are beautiful. I just saw a white-tailed squirrel in the tree outside my kitchen window on Bay Village, Ohio. He’s the only squirrel allowed to eat from my birdfeeder! I live in Central Indiana and just noticed a white tail squirrel this summer. They apparently are pretty common. However, most people have me ER seen one. I live in the North East part of Indianapolis and saw one in my backyard this morning. I was amazed at how beautiful they are. He was eating bird seed that had fallen from the feeder. I will be watching tomorrow for him to return. I have large trees so hopefully there is a nest of them. Hello Nancy–thank you for your comment. They are very unusual, but apparently less rare than I originally thought because I have heard from many people who have also seen one. We have four white tailed squirrels in our neighbors tree in Marshalltown, IA. We had never seen them before, usually we don’t even have grey squirrels. Wish I could find more info on them. I know where there is a colony of them south of Tallahassee, FL. They are very unusual. Oddly, there seems to be a lot of them around. Ditto…we saw our first white-tail squirrel several times yesterday…my wife thinks it was a red-squirrel, and it had an all-white tail ! On the Maumee River near Grand Rapids Ohio. I’m outside lansing MI and have 2 small white tails in my backyard, maybe more, but I only saw two chasing each other around. I’ve never seen anything like it so came straight to google and found this blog. Great pics!! We are camping in Wooster, Ohio and we spotted three baby white tailed squirrels playing on the picnic table..Never saw one before, much less three! In newtown mo I seen a white tailed squirrel in my neighbors tree. Got a picture of it…so cool!!! We have a white tail squirrel here in Elbridge, TN. First we’ve ever seen! We have 2 grey squirrels with white tails in our yard in Chardon Ohio. This is the first time we have ever seen them. They are fun to watch and so unusual. Is it an actual species or a mutation and does anyone know where they originated from? I live in central Illinois. I have white tailed squirrels on my property. I had been seeing one for a long time, but this morning I saw three white tailed one………it is amazing. We have a baby whitetail squirrel in our yard in West Chester, PA. Have pictures. Just saw 2 white tailed squirrels in my backyard this morning in Lebanon, IN. Never saw one before. They are quite beautiful! Didn’t know they existed until now. Amazing! I hope they stick around for my kids to see. I live in Columbus, Indiana (1 hour south of Indianapolis) and I saw a white tailed squirrel in my front yard. So exciting. I feel lucky:) It is neat to see all of the areas these are spotted in. I have a family of 5 babies (now down to 3 I think) with one white tail in our front yard. We live in Jackson County Michigan. Squirrel watching and a cup of coffee is an awesome way to start your day! We have 3 baby white tailed squirrels living in a tree in our back yard. Never seen them before.We live in Mishawaka, Indiana. Saw my first white tail squirrel a couple of days ago in St. Benedict Kansas. Must be a sign of something if they are popping up all over the country. I live in north-central Illinois and we have started seeing these white-tailed squirrels as well. I’m not sure if it a new species or a mutation. I live in Eau Claire, Michigan, and I spotted a white tail this morning.I couldn`t believe my eyes! How very beautiful and unique. This afternoon I spotted two more playing at the bottom of the tree right out my back door, what a treat. Three beautiful creatures of God. I live in westland, michigan. Saw my first white tail squirrel yesterday. Thought I was seeing a freak but I guess they are everywhere. It was really a great sighting! We live in Northwestern Indiana, about 70 miles south of the southern most tip of Lake Michigan. 3 weeks ago we observed 3 young whitetailed redish colored squirrels eating corn in our back yard. I think they are of the same family. Still seeing them every day eating ear corn we put out for that reason. Seeing them is a first for us. We have a white tailed squirrel eating from our bird feeder in Orange City, Ia. Beautiful!! We have spotted 2 white tailed squirrels in our yard this week. So cool! We live near the lakeshore in Fairview, Pa.
We live in West Central Illinois and have been seeing the white tailed gray squirrels around our little town for the past year. Like others we thought they were an anomaly, guess not! We have visited Olney, IL and have seen the white squirrels there. All are beautiful. For the last month we have seen a white-tailed grayish squirrel in our back yard and running across the street. The first time I saw it – I could hardly believe it. Had never heard of it before. We live in Jenison, Michigan, near Grand Rapids. We have a white tailed squirrel living in Ada MN.I hope that he or she never gets run over etc. I’m gonna try and get photo’s of it. I love to watch the squirrel and so do the neighbors. Just saw one in Polk County, Florida a few minutes ago. A brown squirrel with a pure white tail. I live in Montana and I now have 2 of these squirrels in my yard. This is the first time I have ever seen them. They really catch your eye! We have at least two that have been around for a few years now. I live in East Haddam CT. From what I’ve read online this is the farthest east anyone has seen one. Today here in Fort Wayne Indiana outside of the school I work at we have six baby squirrels all with white tails. The mother looks to be a normal Red squirrel. Never seen these before around here and don’t know if they are all from same litter but they were all in the same tree and staying in that area of the tree. Thanks for having the Blog. We live in Murfreesboro Tennessee. We have 2 white tailed Squirrels in our back yard. Just made pictures of one. It just sat on tree limb an looked at me, then ran away. Sylvia ,well a pair of them have made it to VT. I LIVE IN WEST WINDSOR, am 81 and have never seen one before. hopefully they will have a litter. I have a white tail squirrel in my yard. Burton Mi. I also live in Murfreesboro Tn. 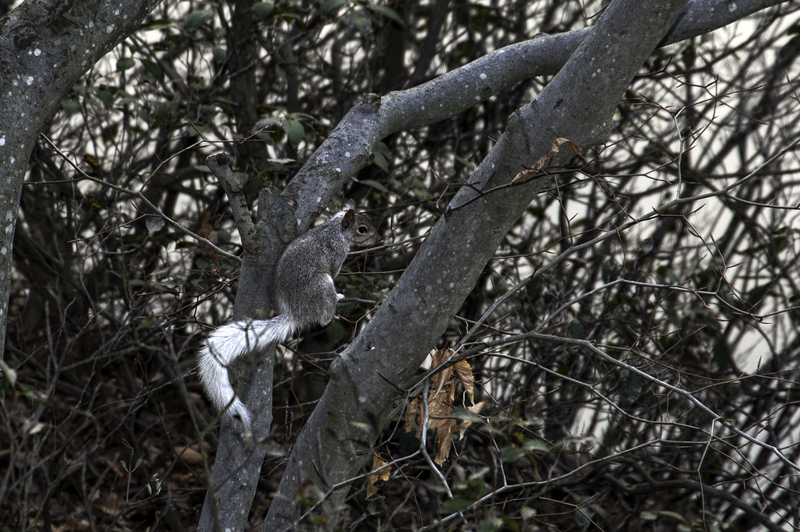 I have a white squirrel with gray tail in my yard. I have several photos of him. He comes on my deck and I throw him a peanut. Here is mine. Took two years to get a decent photo. Sorry there was no photo. I don’t see a way to post a photo on here as I would like to post a pic also. I google the red squirrels with white tails because I have 2 of them coming to my back yard now,funny thing is I have the all red squirrels coming here to but their never out there togeather,when the white tailed one leaves the all red ones come,I live in Elizabeth Pa.This is the first time I seen that type of squirrel. Hey Steve T. my husband spotted two white tailed squirrels W. End of Huntington Park in BV. June 30 2017 while painting with a friend. Grayish tan body… smaller bodied than the reds. Wild! I spotted one on my early morning walk in the suburbs of St. Louis, MO. I couldn’t get a good photo on my cell phone in time so I appreciated finding your nice shots today to share with my family. (I learned that the $10 word for these unusually pigmented animals and birds is “leucitic.” Guess it sounds more sophisticated than “cottontail squirrel”!) My husband has recently taken up nature photography fairly seriously and we enjoyed perusing your work! Thank you for your comments Amy on my leucitic squirrel images! We have four baby (?) white-tailed squirrels here in Painesville, Ohio. Started seeing them a couple years ago. One has no tail or a small bit of white tail that looks like something got it and maybe bit if off. I wonder what has caused this new and obviously wide-spread mutation? I seem to remember on the Island seeing two pure white squirrels and they were around for at least 3 years. So I am not surprised that there would be a white bay out there as well. The Montclair island is a great place. Miss it. When we lived in where you are Steve, we used to see him all the time right at the beginning of the Island. Not sure if that is the same one or a relative but he or she has been on the Island for awhile if I am not mistaken. I have noticed one in my back yard the last couple of weeks but today I was watching it scurry across my garage roof and saw a smaller one one the other side of the yard. Thanks for posting this and to all who commented here so that I could learn more about this fascinating phenomenon. I was camping at Chain O’Lakes State Park in Northern Indiana last week and saw a white tailed squirrel twice near the same tree! when I posted my picture of it on Facebook, another friend who also lives in Northern Indiana posted back with another white tailed squirrel eating out of her bird feeder on her deck! !